As we move into 2012, "America's Third War" rages only miles from me, my family and friends. South Texas has become a war zone no one wishes to talk about. I've been posting "Texas/Mexico Border News" for quite some time now, had my hand "virtually slapped" by Cartel zappers, but I continue in an effort to keep people informed on what is actually going on here in South Texas. People are dying, firefights across the Rio Grande on a daily basis and Texas residents actually losing ranches and other properties to the Cartels as move to "safe haven" here in the United States. I ran across Sylvia's blog this evening, and found it extremely insightful and informative on what is actually going on. Pick up a copy of her book, "Cartel" and leave a review or comments in the section below. 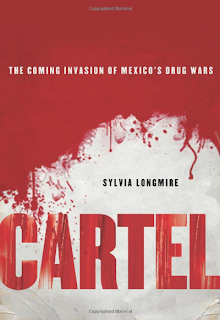 Read Ms. Longmire's Blog on the Mexican Drug War HERE. Interesting review! I like reading books that can make us think about our life and how little things affect everything in this world. I know that some people live in their personal vacuum and don'r want to pay attention on surrounding life. The great example is when translation attracting volunteers don't think about the conditions of professional promotional and motivation.